When and where is the Breeders Cup? This entry was posted on August 7, 2012 by Sports Traveler. Earlier this year the horse racing world missed out an opportunity for a Triple Crown winner in a most unfortunate manner. The outcome was clearly the best and healthiest choice for the horse but no one likes to see a chance at history hindered by an injury. The run for the Triple Crown might be over but there is still exciting racing left in 2012. In just a couple of months the 29th annual running of the Breeders Cup will get underway on November 2nd. The Breeders Cup is currently and has historically been the richest North American horse race. Last year the total amount of winnings came to 25.5 million and that has been the total purse since the additions of 3 races in 2008. In 2011 the races were held at Churchill Downs for the eighth time overall and the second time in as many years. Churchill Downs is of course the host track of the Kentucky Derby, the most famous horse race in the world. After a two year hiatus, the richest race day in America returns to California and the familiar grounds of Santa Anita. Below is a list of all tracks used for the Breeders Cup and times the venue hosted the event. This will mark the sixth time that the event will come to Santa Anita Park and the tenth trip to the state of California. 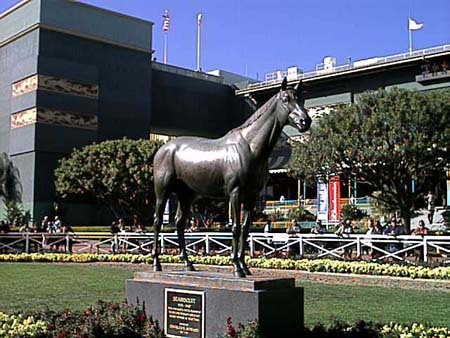 Santa Anita Park is located in Arcadia, CA and lies beautifully along the San Gabriel Mountains. Other than hosting the Breeders Cup, the track is also famous for hosting the popular Santa Anita Derby and Santa Anita Handicap. As always the Breeders Cup will be a 2 day featured event with the Breeders Cup Classic race happening on November 3rd. The 5 million dollar purse is one of the biggest in the world and provides for a very exciting race every year. Last year the 3 year old Drosselmeyer took the 5 million and the victory in the Classic. Drosselmeyer was also the winner of the 2010 Belmont Stakes so its not out of the question to see a familiar name in the winners circle on Saturday at the Breeders Classic. As someone who as attended the event I would strongly recommend for any horse racing fan to make a trip to this event. I think the Breeders Cup is the most fun of all major American horse races. So many races, so much excitement. Love it. If you are feeling the itch for some horse racing excitement take a look at our available travel packages and tickets for the 2012 Breeders Cup. Hope to see you there!